On May 20, 1803, David Hale and Oliver Hale purchased lot 99 of school lands in Turner, Androscoggin County, Maine. Frederick John Kingsbury, The Genealogy of the Descendants of Henry Kingsbury of Ipswich and Haverhill, Hartford Press, (1905) , p. 265. Robert Safford Hale, Genealogy of descendants of Thomas Hale of Watton, England, and of Newbury, Mass., , at https://archive.org/stream/genealogyofdesce00hale . Albany, N.Y.: Weed, Parsons and Company, printers, (1889) , p. 380 says he was born in Turner, Maine, but both the 1850 and 1860 census say he was born in Massachusetts. 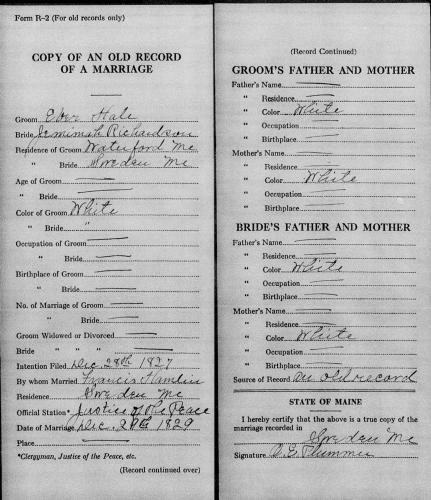 "Maine Marriages, 1771-1907," database, FamilySearch (https://familysearch.org/ark:/61903/1:1:F4FD-153 : 4 December 2014), David Hale and Ester Eustis, 07 Sep 1843; citing Jay,Franklin,Maine, reference ; FHL microfilm 11,037. Vital records of Boxford, Massachusetts, to the end of the year 1849, Topsfield, Massachusetts: Topsfield Historical Society, (1905) , p. 43. Census Place: New Durham, Strafford, New Hampshire; Roll: T624_866; Page: 3B; Enumeration District: 0291; FHL microfilm: 1374879. "Maine Births and Christenings, 1739-1900," database, FamilySearch (https://familysearch.org/ark:/61903/1:1:F4QN-68H : accessed 6 September 2015), Eber Hale, 15 May 1802; citing Waterford, Oxford, Maine; FHL microfilm 12,625. Unknown author, "unknown article title," New England Historic Genealogical Register: Jan. 1988, p. 34. 1880 United States. Census Office. 10th census, 1880 federal population census, Washington, District of Columbia: National Archives and Records Service, ([19--]) , FHL Film 1255425; National Archives Film T9-1425; Page 529D. "Maine Births and Christenings, 1739-1900," database, FamilySearch (https://familysearch.org/ark:/61903/1:1:F4SZ-G4K : accessed 6 September 2015), Charles Henry Hale, 15 Jun 1830; citing Waterford, Oxford, Maine; FHL microfilm 12,625. "Maine Vital Records, 1670-1907 ", database with images, FamilySearch (https://familysearch.org/ark:/61903/1:1:2HVZ-8J1 : accessed 6 September 2015), Eliza Ann Hale, 1836. Robert Safford Hale, Genealogy of descendants of Thomas Hale of Watton, England, and of Newbury, Mass., , at https://archive.org/stream/genealogyofdesce00hale . Albany, N.Y.: Weed, Parsons and Company, printers, (1889) , p. 343. Edward Oliver Hale was born on May 13, 1838 in Waterford, Oxford County, Maine. He was the son of Oliver Hale Jr. and Harriet Waite. Edward Russell Hale was vice president of the Board of Trustees of Bradford Junior College, and a member of the American, Massachusetts, and Essex County Bar Associations. He was a Republican, and a member of the Union Club in Boston, the Harvard Club in New York City, the Stadocona Fish & Game Club in Quebec, the Federal Fire Society in Portsmouth, N.H., the Curtis Club, and the Odd Volumes Club in Boston. Edward Russell Hale was a lawyer. Edward Russell Hale was chief counsel in Hoosac Mills case (U.S. vs. Butler) which resulted in the invalidation of processing taxes and the unconstitutionality of the Agricultural Adjustment Act. Edward Russell Hale lived at Little Boar's Head, North Hampton, Rockingham County, New Hampshire. Edward Russell Hale was graduated in 1906 from Bowdoin College A.B. He was educated at Harvard University Law School, Cambridge, Massachusetts, between 1908 and 1910. He was in 1910 admitted to the Massachusetts Bar. He was between 1914 and 1919 of Haverhill, Massachusetts, chairman of the Republican City Committee. Between 1914 and 1919, Edward Russell Hale was a member of the Republican State Committee. In 1916, Edward Russell Hale was a delegate to Republican National Convention. Between 1917 and 1918, Edward Russell Hale was with the Massachusetts Constitutional Convention. He was in 1922 admitted to the Maine Bar. In 1924, Edward Russell Hale was special justice to the Central District Court of Essex County, Massachusetts. Between 1926 and 1928, Edward Russell Hale was chief assistant U.S. District Attorney in Massachusetts. Between 1926 and 1928, Edward Russell Hale was a member of Hale & Sanderson. in Boston, Massachusetts. Between 1928 and 1958, Edward Russell Hale was a member of Hale, Sanderson, Byrnes & Morton. Between 1931 and 1933, Edward Russell Hale was a special counsel of the Massachusetts Bank Commissioners at Massachusetts. In 1935, Edward Russell Hale was practiced before the U.S. Supreme Court. Between December, 1935 and January, 1936, Edward Russell Hale argued before U.S. Supreme Court. Between 1958 and 1963, Edward Russell Hale was a member of Marvin, Peyser, Hale & Sanderson. Edward died on July 5, 1963 at age 79. He was buried in Central Cemetery, Rye, Rockingham County, New Hampshire. Hale, Elbridge G., cracker pedler, house 391 Main. Hale, Elbridge G., cracker pedler, house 22 Brookline. Hale, Elbridge G., driver bakers' wagon, boards 533 Main. Sherborn > Valuation Tax, 1827-1834 > 120. Town and City Clerks of Massachusetts, Massachusetts Vital and Town Records, Provo, UT: Holbrook Research Institute (Jay and Delene Holbrook), , Barnstable > Town Records Births, Marriages Deaths, 1816-1875 > 109. 1840 United States. Census Office. 6th census, Census schedules, 1840, Washington, District of Columbia: National Archives. Central Plains Region,, (1938, 1950) , Census Place: Sandwich, Barnstable, Massachusetts; Roll: 173; Page: 60; Image: 126; Family History Library Film: 0014674. 1880 United States. Census Office. 10th census, 1880 federal population census, Washington, District of Columbia: National Archives and Records Service, ([19--]) , Census Place: Barnstable, Barnstable, Massachusetts; Roll: T9_519; Family History Film: 1254519; Page: 196.2000; Enumeration District: 11; Image: 0394. Massachusetts Vital Records, 1841-1910, , Vol: 319 ; Page: 1. 1880 United States. Census Office. 10th census, 1880 federal population census, Washington, District of Columbia: National Archives and Records Service, ([19--]) , Census Place: Lee, Penobscot, Maine; Roll: 486; Family History Film: 1254486; Page: 422A; Enumeration District: 043; Image: 0445. Elizabeth Hale was born on March 28, 1793 in Waterford, Oxford County, Maine. Elizabeth died on July 25, 1817 in Waterford, Oxford County, Maine, at age 24. Robert Safford Hale, Genealogy of descendants of Thomas Hale of Watton, England, and of Newbury, Mass., , at https://archive.org/stream/genealogyofdesce00hale . Albany, N.Y.: Weed, Parsons and Company, printers, (1889) , p. 222. She was the daughter of Benjamin Hale and Mary L. "Polly" Shaw. "Maine Births and Christenings, 1739-1900," database, FamilySearch (https://familysearch.org/ark:/61903/1:1:F4SC-RPJ : 4 December 2014), Betsy Hale, 25 Jan 1829; citing Waterford, Oxford, Maine; FHL microfilm 12,625. "Maine, Births and Christenings, 1739-1900," index, FamilySearch (https://familysearch.org/pal:/MM9.1.1/F4SC-RPJ : accessed 02 Jan 2013), Betsy Hale, 25 Jan 1829; citing reference yr 1762-1859 p 60, FHL microfilm 12625. Elizabeth I. Hale was born in 1856/57 in Waterford, Oxford County, Maine. Daughters of the American Revolution., Lineage book / National Society of the Daughters of the American Revolution, Washington, D. C.: The Society, (1896-) , 1912; vol. 35, p. 224-5. 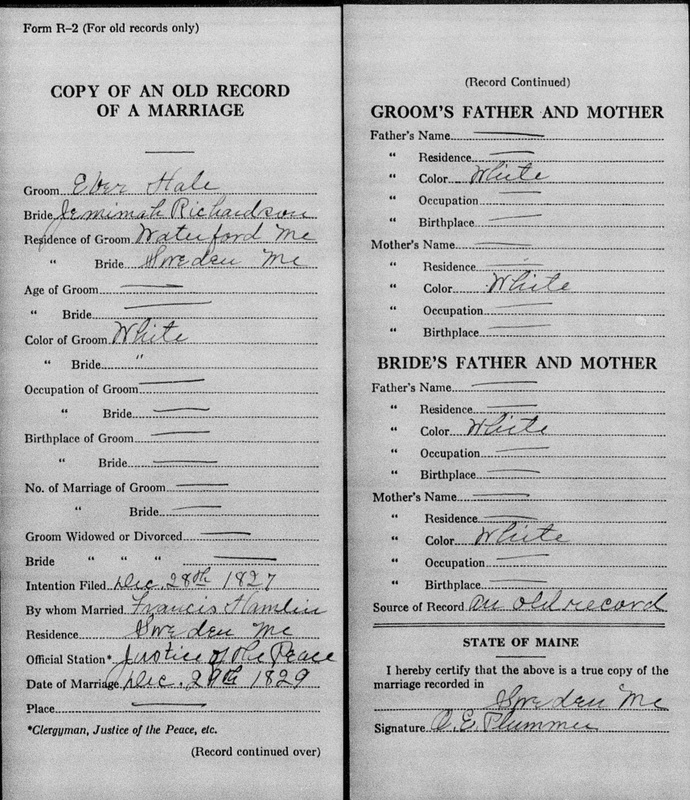 "Maine, Births and Christenings, 1739-1900," index, FamilySearch (https://familysearch.org/pal:/MM9.1.1/F4S8-X31 : accessed 25 Nov 2012), John R. Hale in entry for Ellen L. Hale, 09 Oct 1852; citing reference 2:1VL0ZJ0, FHL microfilm 11531. "Massachusetts, Deaths, 1841-1915," index and images, FamilySearch (https://familysearch.org/pal:/MM9.1.1/NWJV-4V3 : accessed 25 Nov 2012), John R. Hale in entry for Helen L. Hale, 1899.